Ventana Surfboards & Supplies sells hollow reclaimed wooden surfboards, bodysurfing handplanes, eco apparel and sustainable surf supplies that are loved by adventurers everywhere. The Ventana team lives and works in Santa Cruz, California where they test their products on some of the most challenging waves on the planet. Ventana donates at least 5% of profits to ocean conservation. They are an online store and wholesaler with occasional pop-up shops in California. Ecoboard Audit Results Ventana’s Santa Cruz-based manufacturing site was audited by Sustainable Surf. The company has effective processes to ensure approved materials are used in Gold Level qualifying boards. Ventana’s surfboards are produced from reclaimed, recycled and repurposed materials and finished with Entropy ONE bio-based resin. Wood is generally locally sourced, up-cycled from waste produced by local organizations – giving each board a unique sustainability story. For example, boards may contain Santa Cruz Guitar Company Indian rosewood, redwood floorboards from a Santa Cruz mansion, Alaskan yellow cedar from Monterey Bay Aquarium benches and walnut offcuts from a cabinet shop in Santa Cruz. The rails on Ventana’s boards are made of sustainably-sourced oak cork. This not only provides a beautiful aesthetic to each board, it also results in a more robust, impact-resistant structure. 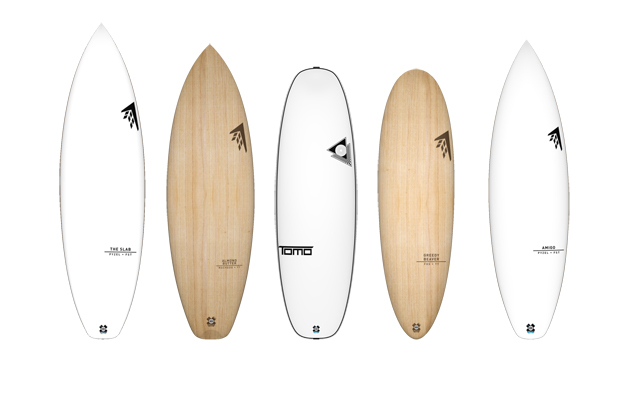 Fins are also handcrafted from reclaimed wood and glassed in Entropy bio-resin. Energy Ventana applies the same ‘no-waste’ principles that are part of their board manufacturing process to energy management on site. All machinery and lighting is turned off when not in use, and the layout of the production space takes advantage of natural light. Being a leased property, Ventana has committed to taking the lead on discussing options for green energy purchasing with the current landlords. With two other Ecoboard builders within the complex – this is a great approach. They have used sawdust to make soy wax fire starters and have added it to beach trash bottle candles:http://ventana.surf/candles. Some reclaimed wood that isn’t used in their surfboards and handplanes is used for apparel hangtags (leash cord key chains) coupled with leftovers from the production of Khordz Mugs made by a partner company: http://ventana.surf/khordz. Offcuts are also used to create other things, like the 2016 Save The Waves awards this year. Packaging N/A – Boards are generally hand delivered. Health and safety In addition to eliminating foam, the exclusive use of bio-epoxy results in a low-VOC process. Appropriate personal protective equipment is used on site. Brand Description MC’s PROCESS IS SIMPLE. DESIGN BY MIND. CUT BY MACHINE. SHAPE BY HAND. FINISH WITH LOVE. 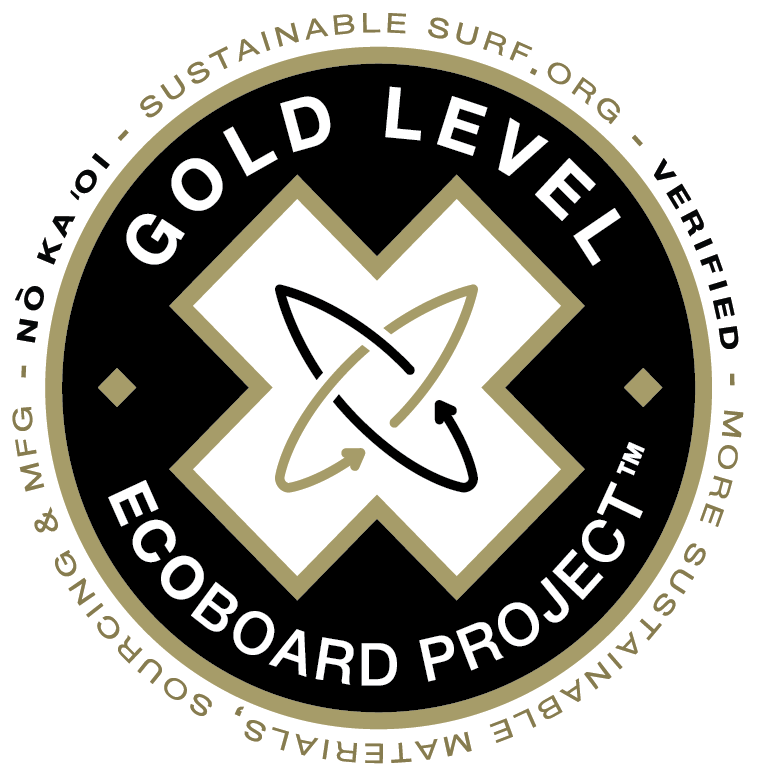 Surfboard Sustainability Level One ECOBOARDS using qualifying resins and blanks. Starboard was founded in 1993 by Norwegian windsurfing world champion Svein Rasmussen, and is a top global brand across SUP, windsurf, kiteboard and surfboard design. The brand introduced an innovative molded wood sandwich technology from its early day’s base in New Caledonian, propelling Starboard to become the windsurfing world leader by 2001 and further winning the PWA constructors championships 9 times the last 10 years. As one of the most respected paddle board manufacturers in the world, Starboard has pioneered groundbreaking designs like the Whopper, Hypernut and Allstar, while the iconic Carbon sandwich technology set the benchmark in great craftsmanship. Starboard is leading the current SUP racers brand ranking with Connor Baxter, Michael Booth, Fiona Wylde and Matt Nottage, all on production boards. World champions Sean Pointer , Izzy Gomes and The Ultimate Waterman Zane Schweitzer lead a team of more than 300 riders world wide motivating the Thailand based HQ to be on the cutting edge of development. Starboard (and all related “Tiki” brands) targets to become Carbon Neutral by the end of 2018 , by implementing a number of eco innovations in its global operations. thus setting a new standard for what can be achieved in a short time. 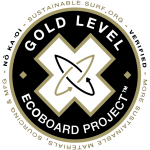 Company Sustainability Efforts In a pioneering first for a global SUP and windsurf board company, all 2017 Starboard models will be eligible to carry the ECOBOARD Project label, as a result of shifting 100% of their global production to now use approved plant-based, low/zero VOCs, epoxy resin systems. Along with a host of other shifts towards more sustainable materials and processes, Starboard’s actions will result in a smaller carbon footprint across their 2017 board range, and ultimately a healthier ocean for everyone. Starboard’s commitment to reducing impacts from all major components of their 2017 model boards goes beyond just the boards themselves – as all their composite SUP fins , and all composite paddle blades, will also be infused with an approved bio epoxy resin. Additionally, all their plastic fins will gradually shift during 2017 to 100% bio-based plastics, enabling the use of stronger and more durable materials with a lower carbon footprint. Production on 2017 models started in June, and boards will be shipping in July. Additionally Starboard will be shifting all packaging to more sustainable materials (including removing the traditional dust protector bag ). Starboard will also be shifting away from styrofoam-based protective packaging and instead using reinforced cardboard for added strength and more shock absorption protection than currently sourced packaging materials. “We are just really getting started on our brand’s sustainability pathway related to all of our products, say’s Svein Rasmusen, founder and CEO of Starboard. “But we’ve been stoked to work with Sustainable Surf to reduce the carbon footprint of all our composite boards by switching to bio-based epoxy resins, reducing overall paint use / VOCs, and sourcing better packaging materials. We also have lots of other R&D in process for better performing materials related to traction pads, fins, inserts, paddles that use recycled materials and plant-based plastics. And I can’t wait to see our “Concept Starboard” at our international dealers meeting in San Diego on the 25th of September ( http://www.world-dealer-meeting.com<http://www.world-dealer-meeting.com/>) , which will showcase the use of as many of these new materials and processes as possible. The big idea is to drive ourselves, and the whole industry forward, by creating a realistic model for what could be achievable over the next 3 years to produce a eco-revolution in high performance manufacturing.Reinforcing their commitment to thinking globally but also acting locally, Starboard is partnering with several organizations on their home turf in South East Asia to support sustainability initiatives focused on cleaning up plastic pollution from beaches and waterways (Trash Hero http://trashhero.org/ ), fighting climate change (Worldview international foundation http://www.thorheyerdahlclimatepark.org/ ) and recycling styrofoam ( Polyfoam http://www.polyfoam.co.th/home.html ) among others. Opened in 2010, Sunset Shapers is a fully integrated surfboard manufacturing center. They build boards start to finish with their own in-house design, shaping, art, and glassing facilities. By providing full service contract glassing they are a resource for hobbyists and local surfboard manufacturers alike. They also supply blanks, resins, fiberglass, and other materials needed in the building process to local board builders. Founded by Robert Weiner in 1994 with his main goal being to create high caliber, high quality surfboards that will push the envelope of our sport. Since that time, not only has the sport progressed at a rate no one would have expected, but the company has grown from its roots in Ventura to become one of the most popular labels in California, East Coast USA, Japan and growing around the World. PuraKai is an eco-friendly clothing and high performance surf craft manufacturer owned and operated by eco-minded surfers. The Ocean is Our Playground so we feel as “makers” it’s our responsibility to protect it. PuraKai clothing, surfboards and stand up paddle boards are made locally using organic, recycled and bio-based materials. Their goal is to create products in way that balances the need for consumption with the negative effects on the natural world and oceans. As members of 1% For the Planet they’ve committed to return a minimum of 1% of revenue to support Ocean Conservation. Every board is made with an eps foam core containing 25% recycled content and glassed with bio based epoxy resin.